Were any changes made to the US TG-16 version? It was localized by Working Designs and they were known for tweaking things. Hmm, Crude Busters hasn't dated as well as I'd imagined. It feels a lot more sluggish than I remember - the grab move in particular, and there's not a huge amount of feedback when you're taking damage. I also don't remember enemies being able to decimate your health bar with one or two hits, but in fairness it's been a long time. I'll have another go later, but first impressions were that it carries the same 'disconnected' feeling that puts me off Dragonninja. Not that I've noticed, but I've only played the english and japanese versions once each. If Working Designs did mess with things then they at least weren't as egregious as they were in some of the other games they worked on. Great writeup Vanguard; added it to the index. Don't know which version you're playing, but the MD port is significantly better than the arcade original and most definitely worth playing. Playing the arcade version on Switch, and have still to make it past the first boss on one credit. It's a game I do very much want to like, but there a bunch of niggles holding it back. I've just read up on the previous posts regarding to MD version - sounds very much worth trying out. I do remember playing at the time but probably wrote it off as a downgraded arcade port - the stupidity of youth! Yeah, he MD port is great; really a step up in every way, excepting graphics and audio (the arcade version's voice samples are awesome), but if you have the opportunity to (re)play it, don't hesitate - especially after experiencing the original. The voice samples aren't as good, but the music in the MD version is excellent and arguably better than the AC version's music. Yes, love the soundtrack of MD Crude Buster. More bombastic Data East synth courtesy of the Terpsichorean sound driver ala Midnight Resistance. It had been a while, so I just re-listened to both soundtracks, and I'm inclined to agree. Though it must be said, the arcade's soundtrack is really good too, and the voice samples really add to the experience. Recently ran through Wonder Boy in Monster World. For anyone not familiar, it's a mostly-linear fantasy metroidvania in the same vein as Faxanadu. The premise is that evil monsters have invaded Monster World and one man has decided he's not going to take it anymore. There's very little plot, most of the game is spent finding the people and items you need to restore a legendary sword. I like the graphics. They're very cute and perfectly capture the spirit of Wonder Boy III: The Dragon's Trap in a higher resolution. For the most part, Wonder Boy in Monster World's RPG elements work well. Without grinding you'll be able to afford to buy everything you need but not everything you want. Both exploration and advancing the story feel rewarding because there's always something nice around the next corner. Most pieces of equipment are just numerical upgrades over what was previously available, but there are two distinct weapon types, swords and spears. Swords swing in a vertical arc, have tiny hitboxes, and allow the use of shields. Spears have better reach and can parry projectiles but require both hands. The game does, unfortunately, start you out with a painfully slow move speed to give you more room to grow with speed upgrades. There's a set of shoes available a few minutes into the game that that bring your speed up to a palatable level, but that sort of thing shouldn't happen in the first place. I've found that the best idea is to buy weapon and armor upgrades whenever you can and to only buy shields if yours is severely out of date. I don't like trading away a spear for a sword but the knight sword and excalibur both do twice as much damage as the best spears available at the time. The battle spear is the only weapon I'd pass on since it's expensive and you'll be forced to switch to the pygmy sword soon anyway. For shoes you should definitely buy the leather shoes at the beginning and then switch for the marine shoes, which you'll want to use for most of the game. They're the best shoes for swimming, they let you run almost as fast as the legend shoes, and they beat the legend shoes at jumping. They're worth switching to on the endgame moving platform section. The difficulty is a little gentle but not too bad. The weakest part of the game is its common enemies. The enemies themselves are varied enough, the problem is that once you figure out how to beat one, the exact same method will beat every other enemy of that type. Well-designed enemies must be sensitive to context - the same enemy should become a different encounter when faced on different terrain or when paired with other enemy types. Wonder Boy in Monster World does not take advantage of this. Most of the damage you take from regular enemies will be due to spacing mistakes since your movement has lots of inertia and your swords' hitboxes are tiny. The bosses are good enough for what they are. They're all unique and can all put up at least a bit of a fight. Biomeka at the end is a huge difficulty spike over everything else. I've read that he's much easier in the Japanese version, but it's a good change. He makes for a more memorable climax and he gives you a good reason to care about those hidden heart containers and magic spells. Overall it's a perfectly enjoyable game but not a must-play. I've been replaying a lot of the Konami games now that I got my top loader. * Tried to do the second loop of Castlevania, but it's way too time-consuming just getting through the first loop to begin with that by the time I've reached the second loop, I lost any motivation to do so. I kinda wish the NES version had an equivalent to the AKAMA code that just starts you off at the harder mode without having to beat the game once. In that sense, the FC Disk version had an advantage over the NES cartridge port or even the later FC Cassette re-release. Of course, I could always just emulate the VS. System version if I truly want a harder version of the game and crank up the DIP switches. * Contra and Super C are a blast, but I really ought to do a no power-ups run of both games one of these days, or the very least avoid using the spreader in this game. I got tired of both during the third loop of each. I still don't get why both of them still have a reputation as hard games, when Spread Gun + Rapid Bullets really break the game (and the Fire Gun is also really effective in Super C if you use the charge shot). I really need to get the FC version of the first game and Salamander one of these days. Currently I'm going through Rush'n Attack (which is pretty tough) and I'm thinking of tackling Jackal or Gradius next. I also have Bionic Commando, Xexyz and Iron Tank in my backlog. I recorded a Cadash playthrough using the ninja that shows Cadash's major sequence break. Funnily enough I've just spotted a bug in the Switch version - at ST1 mid-boss, every time he gets to let off a shot the soundtrack inexplicably doubles in speed for as long as the flame remains on screen. Bizarre, and doesn't seem to happen anywhere else. I've mostly got the first level down, the two wall-crawlers that jump out of the house just before the boss were double-teaming me and taking a full life more often than not, I've dealt with the in the time-honoured tradition of scrolling the screen slowly enough to only spawn one of them in. Boss seems learnable. First half of ST2 actually seems easier than ST1, and I had the mid-boss down to it's last slither of health by getting in close and wailing on it. At which point it managed to get one hit in and I couldn't get past its arms to get back in close. Definitely going to have to check out that MD port now, just been watching some of the clips in that thread and it looks a LOT more fluid and fast-paced. Yeah, I checked and it happens in MAME too. Maybe a dumb question but what would be a good scrolling game to start playing ‘seriously’ and work on not just being a scrub. Love the genre but notice I am terrible and credit munch all day. 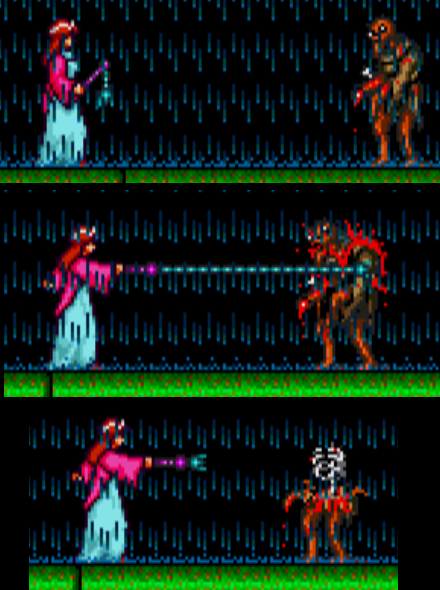 Ninja Gaiden (NES) is the ultimate initiation ritual. I think it depends on what kind of sidescrolling action game you're looking for: Castlevania and Ninja Gaiden are more close-quarters, whereas something like Contra or Daimakaimura are projectile based (I was gonna call them run 'n guns, but Dai doesn't have guns ). Dai either for the arcade of Mega Drive, and the rest for the Famicom/NES. If you don't have a preference, and recommending on difficulty alone (those four are all great games), I'd say Contra. It seems quite tough at first, with the 1HKO and 3 lives, but it gets considerably easier after a while. In contrast, Castlevania and NG start off rather easy (since you can take several hits before dying), but get much harder later on. Daimakaimura let's you get hit once before dying (that is, 2HP), but it's also a pretty hard game. The upside of all of those, except Contra, is that they are checkpoint based, so even though you can continue forever, you still need the skill and perseverance to make strides in them, so continuing isn't much of a problem (and in fact very useful to learn the stages). Contra let's you continue on the spot, much like Metal Slug, so continuing guarantees that you reach the end. There are countless other good games that can be recommended, though I think these are the classics of sidescrolling action, albeit not the easiest around. It depends on your skill level. NES Contra is a good choice to start out. It's both a must-play classic and very approachable. I think Contra is totally doable for low level. It's not as nasty as its mainstream reputation leads on. As noted above, you respawn where you died and enemy bullets aren't very fast. Plus it's short and sweet. I forgot to mention, but Super C (FC) is very similar to Contra, both in quality and difficulty, so you also can't go wrong with it. On the lower difficulty side, you can also try Gun.Dec, Power Blade, or go with one of the classic Megaman games (perhaps the second being the easiest). Vanguard posted a list here (bottom of the post, in spoiler tags) containing some of the best sidescrolling games around, so you can also use that as a reference in the future. Yeah, tbh, I'd consider going Super C (either version, although I'm rather infamously partial to the AC version myself) or Metal Slug 1, just because of the janky "3D" levels in Contra. Yeah, the faux-3D levels are a slog, but I do enjoy the Base 2 boss, especially when not using the spreadshot -- at least it poses a challenge. I wasn't thinking of the the arcade game, though; is Super C AC better - or substantially different - than the FC game? Super C AC is very different than the FC version; different aiming mechanics, mostly different levels. Wasn't aware they were that different; I thought it was a similar deal to Contra AC vs FC -- some differences inherent to a port for such different hardware, but mostly the same in terms of mechanics and levels. Will have to try it out someday. Imagine the polar opposite of Hard Corps WRT its Contra stylings; instead of trying to quickly shuttle you from boss to boss with mostly perfunctory zako sections, Super Contra AC is like pounding your way through a miles-thick flesh wall of endless zakos. Trench warfare at its finest. Kinda reminds me of Ninja Spirit's "Marsh" stage in feel. Thanks for the heads up. I always pictured the FC games as the superior versions, but now I'm looking forward to play it. I'd recommend The Super Shinobi aka Revenge of Shinobi, one of the quintessential side-scrolling action games, in my opinion. It's one that has superb and varied level-design, both projectile and melee attacks to help you fend off the enemies, and has even magic attacks to help when you're in a pinch; the learning curve is pretty gentle and, combined with the methodical pace of the game, enables you to master the way Joe moves and attacks by the time you get to the last and harder stages. You also have a health bar that increases as you progress through the game without continuing, so you're not likely to get frustrated with this one, and it provides a good incentive to aim for the 1CC. The game really shines at high-level play though; tearing through enemies and bosses with your powered-up sword and kunais, taking advantage of Joe's i-frames and blocking is one of the best experiences that you can have in this genre, trust me.